Bloggers Note: Water is having to be hauled in for the horses by Rose herself, often from neighboring areas. This has been an ongoing problem for some time and she needs to have a new well drilled on her property. There is a fundraiser planned for April 28th, 2012 in Pointe Claire. 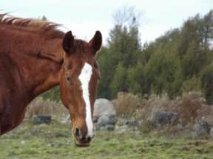 Refuge RR for Horses is a federally registered, charitable organization which rescues, rehabilitates and provides permanent homes for abused, neglected and/or abandoned horses. We also provide peaceful retirement for horses who are no longer serviceable. To raise money for the horse rescue facility ( as well as other animals). $10 cover charge, door prizes, silent auctions (donations welcome for auction) – Live bands – Jam – raising funds to help towards the cost of digging a well for access to water – they are currently …having water trucked in and hauled manually for over 400 animals. The Mayfair Tavern will be donating a percentage of all food and beverage sales to the cause! Super items for sale in the silent Auction! Tickets sold at the door or in advance. If you are unable to attend, PLEASE help and make a TAX-DEDUCTABLE donation at www.refugerr.org.